Strata Collective - Soundlines music and mediascape project with schools and community in Weston super Mare, exploring ways of seeing the layered histories of the landscape of Sand Point, on the North Somerset coast. Contact me for information on papers/presentations. It's report-writing time, to bring the project to a close, and to submit to ACE. A lot of documentation has been generated along the way - this blog, the website, the walks and films themselves, photos, video, interviews, on and offline surveys, email comments, programmes, etc. etc. 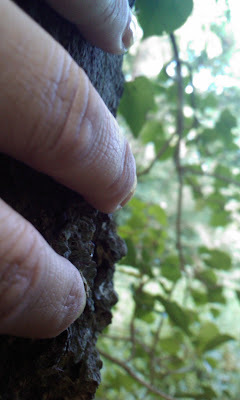 I'd like to collate things through the blog. However, as I found at the start, that's quite tricky given the range of formats and file sizes involved. Maybe something to bare in mind from the start on a future project. - If anyone has suggestions for apps that would work seamlessly that would be great! Meanwhile, I'm aware that a lot of things get filed away at the end of a project, possibly never to see the light of day.. so I'm going to do what I can in adding documents, photos etc - to have an easily accessed reminder of what's been involved, and also to make this as comprehensive a record as possible. I'm going to cheat the timeline though, and add them in at dates that seem most appropriate... labeled 'documentation' for easy reference. For a few of weeks (since the Worle workshops) I've been thinking about new blogs to take on elements of e-merge. They're not all live yet, and more may develop along the way, so I'll just add a short post introducing each one - a kind of family tree of new friends and relationships! Remapped again, this time to an area of Worle Community School at Weston-super-Mare. 6th & 7th July 2009. 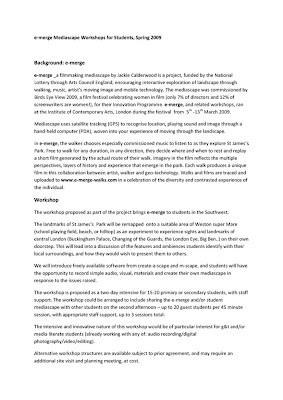 This 2 day intensive workshop for student, staff, and visiting primaries, is the final part of the e-merge project. e-merge remapped, as experience of the central London iconic sights here in Weston. Stimulus for discussion, and design of new content and a new format - 2 new mediascapes made with content created during the workshop by students from years 7, 8 and 9. 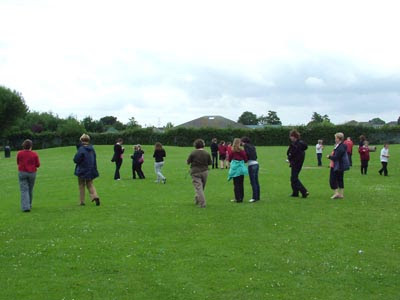 The second day visitors from 2 local primary schools joined us to experience 'Welcome to Worle' - a more conventional mscape with photos and sounds placed around the area. 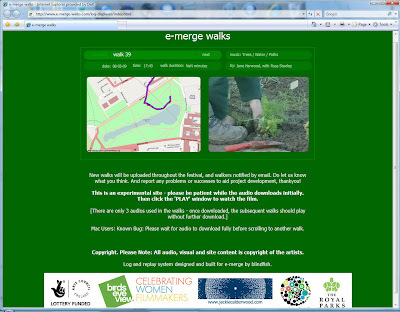 And 'e-merge Student Videos' - a filmmaking walk with the London videos replaced by 38 short videos of life at Worle. I asked Worle workshop participants what they'd particularly noticed about the London films, and what they had noticed or would want to highlight about Worle/school in the mediascape content they were about to make. Sped up sunrise, walking. Time manipulation. 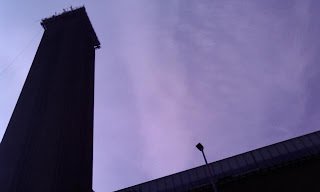 http://www.e-merge-walks.blogspot.com Project development blog started 12/1/09 and updated regularly. Public access including comments. 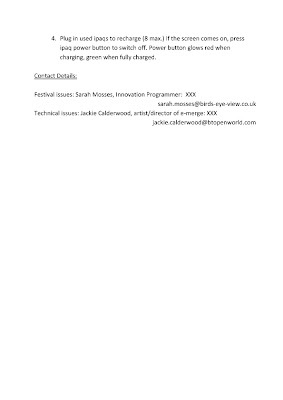 http://www.pmstudio.co.uk/project/e-merge with links to journal entries etc. e-merge listed and linked from website. dot.biz, Wiltshire College, June 2009. It was sunny, so the only obstacles for mediascaping were a football game and a barbeque, also on the fields! 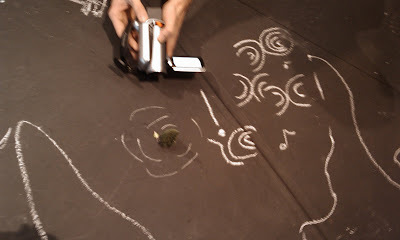 I put a mixture of mscapes on the ipaqs, so there was something for everyone - narrative, drama, film, games - and the obligatory mole stamping, which entertained observers! 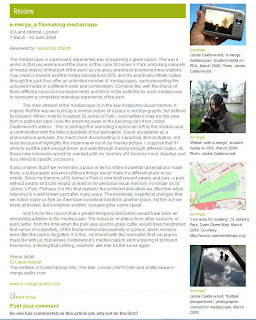 Some good feedback from the remapped e-merge, and interesting to hear people's responses to seeing the London footage in Wiltshire - with several people commenting on the similarity of shots - sky, trees, grass, seagulls on screen and off - whilst others noticed the contrasts more, the busy cityscape and roads. Thanks to Jane for help throughout the day and sharing her experience as a musician and composer for e-merge. Also for her comments on experiencing e-merge live for the first time. Great! 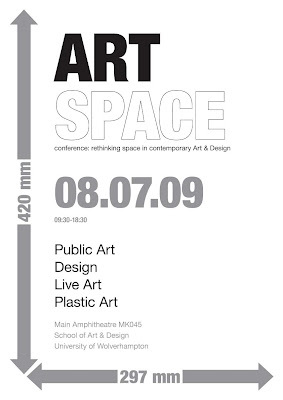 I'll be presenting a paper on 'Pervasive Media: Experience of Landscape and Short Film' at the Art Space conference at CADRE, talking about e-merge and Something More. 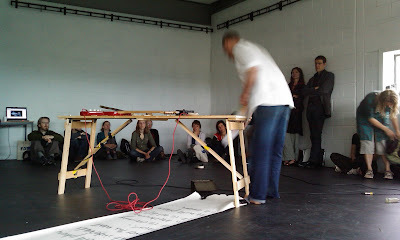 I went to the rather sumptuous Living Landscapes AHRC conference at Aberystwyth last week - packed with interesting performances, installations, papers and plenarys.. and a performance workshop (7am in the woods - nice weather, phew!) Ideas emerging, areas of interest re-inforced, met a few old friends, and many more new. Descending Angel on National Library Sounds, forest art and simultaneous intercontinental performance - documented in the summary session! Soundlines, an educational pervasive landscape project with Strata Collective, has been simmering away in the background for the past 6-7 months, and last night we had our first sample audio-walk with music created by Russ and Jane in response to Sand Point, North Somerset. 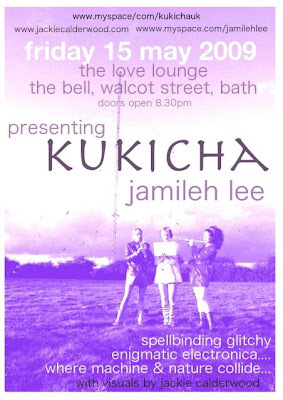 Extract from the Kukicha gig at Bristol's FolkHouse with visuals by Jackie. Roles reversed as Kukicha asked me to make images to accompany their music. We've gone for a nature/machine glitchy film look to complement their wonderful mix of sounds (oboe, clarinet, electronic, voice) and explore how the images work with live performance. Experimental re-mapping of 73 film regions from St James's Park to a small grid of backstreets in Southville. 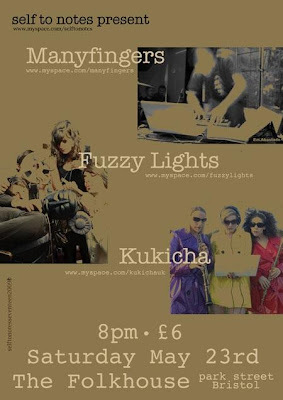 Here's Sophia, composer and lead musician from Bristol-based Kukicha, whose music is featured in e-merge, finding new ways to walk and watch in Southville. 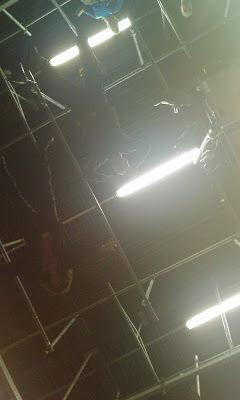 Birds Eye View has post-festival news and photos from the festival - with some of the mediascape in use. A review of e-merge by Alexander Starritt is published on the a-n website's Interface. e-merge was one of 8 events at the sandpit evening at the ICA last Wednesday. 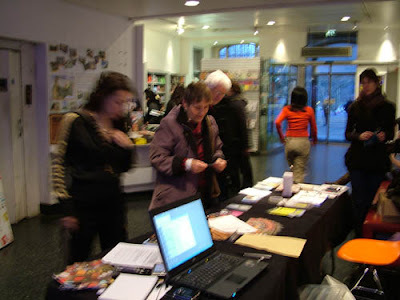 It was a buzzing evening, and over 30 people took part in e-merge, with 62 new walks on the website (numbers 102-163). Thanks to everyone that gave feedback - 64% of those commenting rated the overall experience of e-merge as good or excellent, and 76% said they'd consider playing e-merge again. Great! Good to hear too about the things that didn't work so well, and suggestions for improvement. e-merge was back at the ica last night for the sandpit games night. with a new mini film version of 70 short clips, all theplayers could watch their films live in st james's park. the park's chaanged a lot over the last month since bev. trees in leaf effected the gps a little bit. flags are out all along the mall, and of course the event ran through dusk and into the night - quite a different ambience to the walks. 62 new walks are up on the website, & i will be emailing individual walkers over the next couple of days with the no. of their unique walk. Part of the e-merge project is a workshop with school students in Somerset. I wanted to include this, to bring the project back into the SouthWest region and to share it within an educational context. 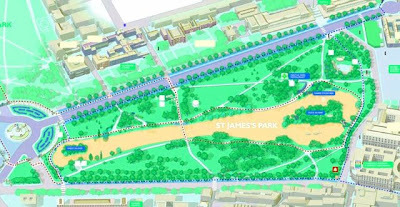 It will be interesting to see how the content transfers to a very different space, and whether the iconic images of central landscape would have any significance or value to young people who may or may not have visited the capital. I anticipate that it may be a good strating point to consider their own environment, and what features of it they would highlight to share with others. It will also be interesting to potentially map the new journeys and films, and/or create new content for the same structure of filmmaking mediascape. This is the workshop outline sent to the school I hope to work with. Saturday was lovely and sunny - and time for a leisurely walk around the park! 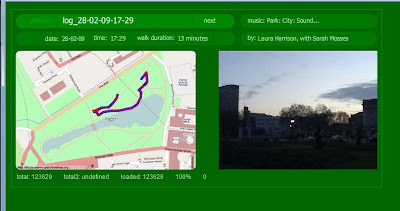 After taking all the remaining logs off the ipaqs, checking them all for software and storage files, and packing up at the ICA, it was great to just go out for a walk and explore parts of the park that other walkers hadn't visited so much. There's lots more documentation, video interviews, and more on the ideas behind the mediascape that I'd like to add to this blog.. so do come back and visit after the festival! And watch this space for news of our plans for an e-merge day in the Park in late spring/early summer. 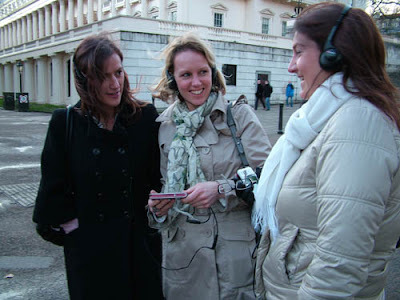 walks & films go live! The walks and films from Friday, Saturday and Sunday are now live on the website! Here's the opening scene and trace of the walk by the ladies pictured below. I had to pop back to Somerset & Bristol for a day, missing a couple of sessions. So time to set out a brief for the BEV volunteers wo-manning the table & equipment, who have been great. Over the weekend it was essential for me to be going out with walkers, making sure they were happy with the equipment and seeing how they (and the technology) behaved with e-merge - and therefore what information people need to be given when they first come to the event. Yesterday about 22 people, all new to mediascapes, came along to Constance's mscape workshop at the festival. One woman I recognised from e-merge the day before, who took lots of notes and seemed very interested to make her own mediascapes. It was great to have people from different backgrounds there - filmmakers, music composers, directors, editors... And interesting for me to sit in on the workshop and see people go through a rapid learning curve with fun, total engagement and innovation in just 2 hours! After a great introduction from Constance, and an experience of a basic mscape outside the ICA, I showed a bit of the 'behind the scenes' workings of e-merge. Harriet's got some video interviews that should be up on the BEV blog shortly, and Constance has written a post on the PMStudio blog too. 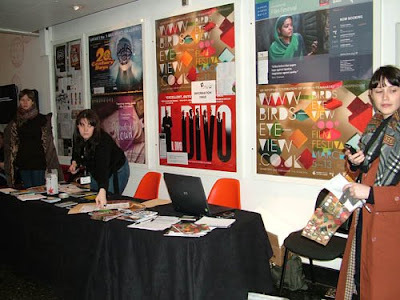 The BEV info stand at the ICA box office (spot the e-merge poster in the background!). It's near the cinema entrances, which is difficult when there's a huge queue waiting to go in (as for the premiere of wonderful The Time of Their Lives today - with Wiltshire guests! ); but also great to catch people who've come out after other films - like the lovely ladies below! 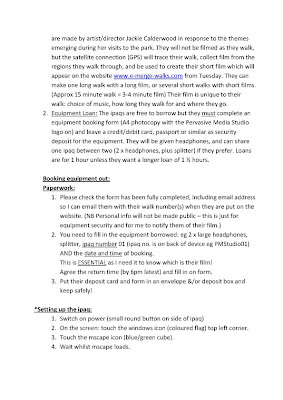 Everyone who asked to be emailed with their unique walk numbers from the website was asked to complete an online survey, with links from the website feedback page too. 1. Have you tried the e-merge mediascape? 2. How did you hear about e-merge? 3. Have you experienced a mediascape before e-merge? 4. Would you describe e-merge as any of the following? 5. 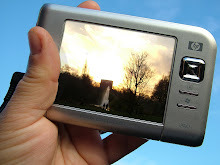 Did you encounter difficulties with the ipaq/ technology? 6. How did the mediascape alter your experience of the park? 7. 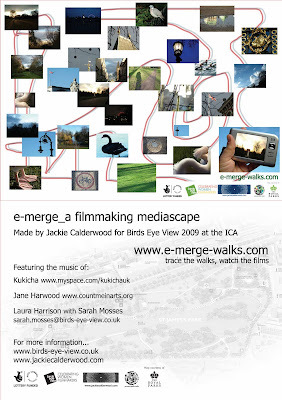 Have you watched any of the e-merge walks-films on the website? 8. Would you prefer to watch your film? 10. Please add any other comments, feedback, development suggestions. Enter your e-mail address if you would like a reply, and for a chance to win a limited edition (1/10) e-merge print. add comments here to tell us how you got on, what you thought of e-merge, how you heard about it, development ideas and all your feedback! Today was fun - I went to visit 2nd year digital media students who are making interpretation for a local museum. They've already filmed some beautiful footage of the Wiltshire landscape - Stonehenge, Avebury in the snow - as well as using images of artefacts and other info on finds from our rich heritage. Afterwards I went to the Wiltshire Community Arts Network meeting in Devizes, to get the latest on the changes to Unitary authority, and what that means for the arts. I spoke about thevery successful Dads Matter Too film and media arts project, as one of several examples of the arts in Wiltshire. The host for the evening told us about a great film showing this Sunday by a Wiltshire colleague at the ICA for Birds Eye View.... small world!! Part of the funding from the Arts Council covers my design & printing of the postcards and some large format print - to entice people new to mscape to have a go! 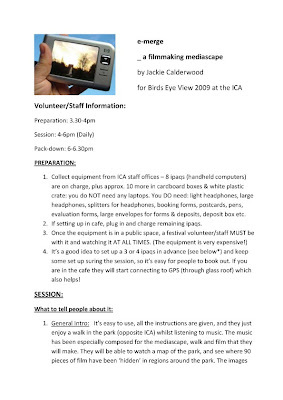 The poster's to put up in the ICA during e-merge sessions and encourage new audiences to book out an ipaq and try the walks. at film playback for the website... work in progress. 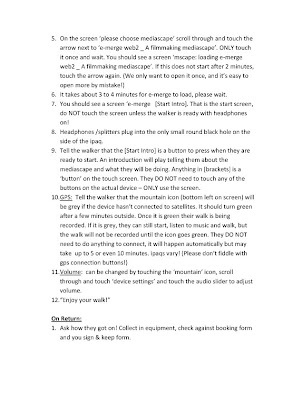 Tricky stuff, as there's a lot of possible video clips that the film could comprise, in any sequence; plus long audio tracks that form the soundtrack - but don't start from the beginning. ... and that's after getting all the information about the walks out of the mediascape! I'm glad I'm not the one making it...... ...thanks Ben! 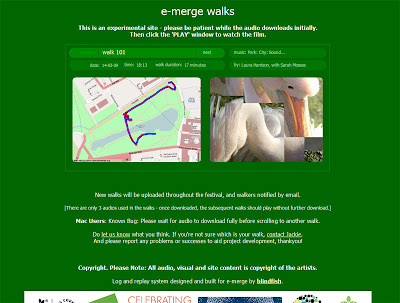 'Tests and traces' was yesterday's theme in the park... look out for some video snippets of the first e-merge walkers at http://www.e-merge-walks.com/ when the festival starts. It was great to see the images playing in the location they're made for, and some useful feedback from the Zeph & Alex, thanks. Pretty quickly the walks were up on a test-site on the web (with wifi & hot chocolate at the ICA cafe), so thankyou to Ben who is busy on the web side of the film-making, right now! 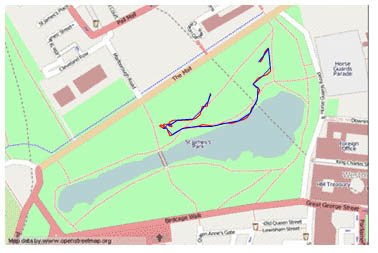 The Royal Parks have kindly agreed to use of their illustrated map in e-merge, so the first task was to walk around the park marking where I was on the map at various points, so mscape could turn the image into a 'real' map.. clever stuff.. 50 points later, and there's a bit of give, but pretty accurate for the central area of the park, so walkers will be able to view their journey on the map if they want to. 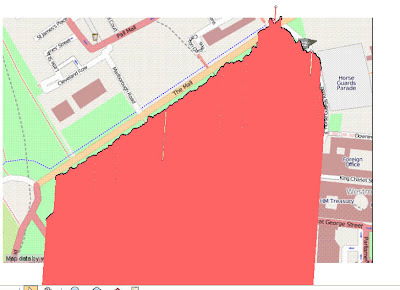 Then checking precise location of 'no-go' areas (like the new dredging site, and the park police station) so that the content regions will be in just the right places. creating a 5.5mb file for a 95 minute walk, and a trace overlay that made me gasp for a moment!! Fortunately it was all salvageable with a few tweaks in excel (thanks for the tips, Zeph!) - so my legs didn't ache in vain! ... there's a lot about time in e-merge, but that's for another post. Postcard 2 is ready for print. Come and try the mediascape! Today was test-time for e-merge at the Pervasive Media Studio, with a rough version mapped into the pedestrian area at the head of the waterside and horseshoe area. Several people from UWE and the studio tried it out and gave useful feedback from their perspectives of games designers, interactive arts, IT, photography and media. Thanks! 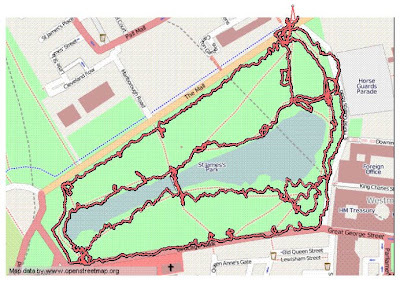 Tomorrow's test-time in the park with a trip to London to finalise maps, regions, active areas and where the content will be 'hidden' as well as test out and document a few other bits & pieces. 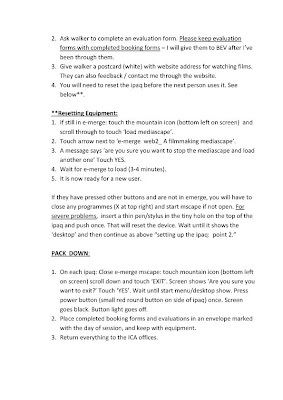 Interactive exploration of landscape through walking, music, artist’s moving image and mobile technology. Enjoy a movie in the park, on your own, or with a friend or family. 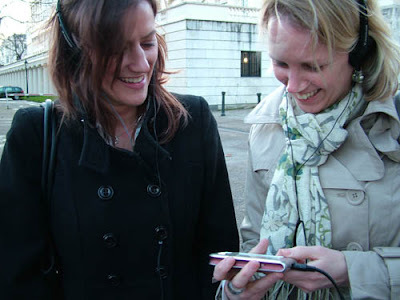 Pick up an ipaq and headphones from mediascape base at the ICA, and explore the park. Choose music especially commissioned for the piece, and wander around – you choose where to walk, how far, how fast – the music may encourage you to twist and turn as you meander the paths around the lakeside. When you’re ready, find a comfy place to watch your film – with images taken from the places you’ve walked, you may find a few surprises too! Make one long film, or several short films, and when you’ve finished we’ll upload a selection of films to the e-merge website http://www.e-merge-walks.com/ so you can watch again, show your friends, and compare films! 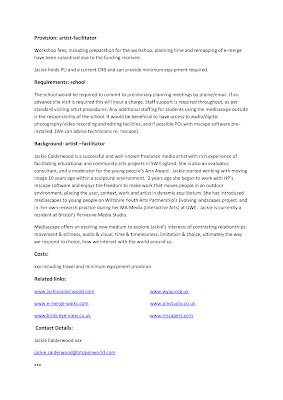 Jackie Calderwood is a freelance media artist working with moving image, interactive and pervasive media. Jackie also creates short films for community arts projects in SW England and is a moderator for the young people’s Arts Award. 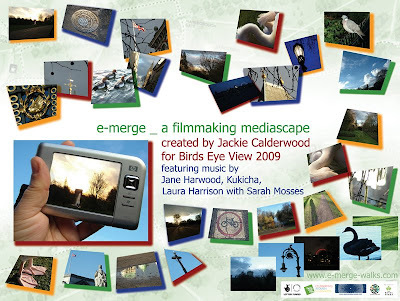 e-merge is part of Jackie’s ongoing research exploring interaction between artist, audience and artefact. Commissioned for Birds Eye View 2009, located in St James’ Park, London [Start point: ICA]. 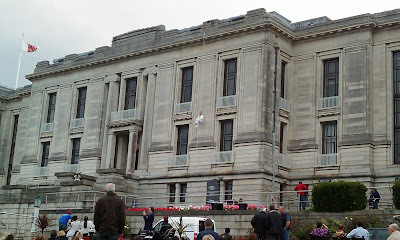 Supported by the National Lottery through Arts Council England. Equipment supported by the Pervasive Media Studio. Illustrated map provided by the Royal Parks.